The mobile device has emerged as the perfect environment for innovation, with apps actually improving millions of lives worldwide. 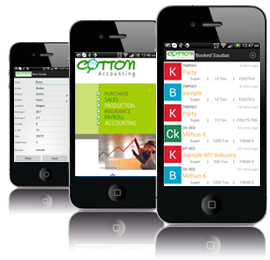 We have developed an IT solution for Cotton Accounting System in order to overcome drawbacks of traditional Management System. As we well known that Management system is usually referring to Operations, thatâ€™s why we Create a centralized system that manage, analyzed, take care of our transaction and provides output in the format of report that are very easy to understand to a common person with little knowledge. We developed an application (Software) to manage all activities of Cotton Ginning Company with department like sales, Purchase, Stock, Insurance, Production Accounts, Pay roll. This application is capable to track each and every transaction that needed to store and manage Different Parts. 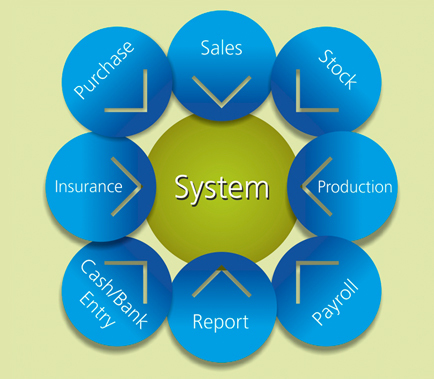 Above figure shows brief overview of the System, from this diagram one can easily conclude that system contain total 8-10 modules. Each and every module play an important role to make a system as a whole, If we carefully observe each module then we will find that all this module are internally correlated means bug in one module may affect other module, but the surprising fact is contrast to the above conclusion means on the basis of reach experience in inventory domain and strong technical support we have developed each module independently means isolated from other module. The major benefit of such development is that on the basis of customer requirement we can easily extend our software without affecting other functionality.